"An enjoyable action adventure. Suspenseful!" The Columbia Review. This is the second installment in the “Reluctant White Knight” series of novels from author T.W. Anderson. The story picks up as our hero, Tom Rowter, faces new challengers with his now familiar mix of reluctance and gusto. In a natural progression from the first novel in the series, “Will It Be Sunny Tomorrow?” and maintaining a similar storytelling tone, “Coyote Running” starts with a short leap of time from where we left off. Rowter, who had been recovering emotionally from losing his first and longtime wife, is now married to the woman we know so well from his previous adventure. The couple had just celebrated their first Thanksgiving together on the ranch, but now they are parting ways in different directions, both geographically and plot wise. While the story starts off with a measured pace, interspersed with flashbacks to what had happened in the preceding year, the pace picks up quickly. The flashbacks work well as they anchor the relationship between the mature lovers and give depth to what they experience next. With some foreign locations and familiar themes (decisiveness, a strong sense of justice, and dry humor) this book provides suspense and action, testing the hero’s commitment to his new bride, as well as his loyalty to past relationships, and a sense of patriotism. The flying scenes, which reflect an infectious passion for aviation, are an enjoyable recouping of the first novel while taking us to new heights. The sense of peril is real and Rowter relies on his skills and experience to get out of tight spots. 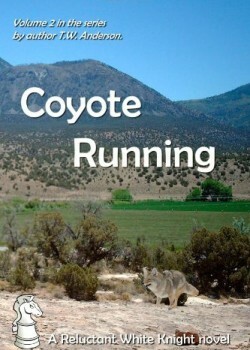 In summary, “Coyote Running” makes for an enjoyable action adventure with sensible continuity from “Will It Be Sunny Tomorrow” and leaves a door wide open for what will happen in the next installment. Enjoy the ride!